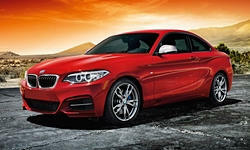 BMW 2-Series Pros and Cons | Page 1 of 1 | Why Not This Car? What drives people to buy (or not buy) a certain car? TrueDelta's members share BMW 2-Series pros and cons based on their real-world driving experiences. The M235 was just named to Car and Driver 10 best 2014.
you have to drive it! it does everything asked of it with comfort and style. The M235i. BMW stays true to their slogan, delivering another Ultimate Driving Machine.